Paleontology is a broad field of study that focuses on the history of life on Earth. Fossils, which are the material remains (bones, teeth, shells) or traces (physical or chemical) of ancient organisms, are what paleontologists study. 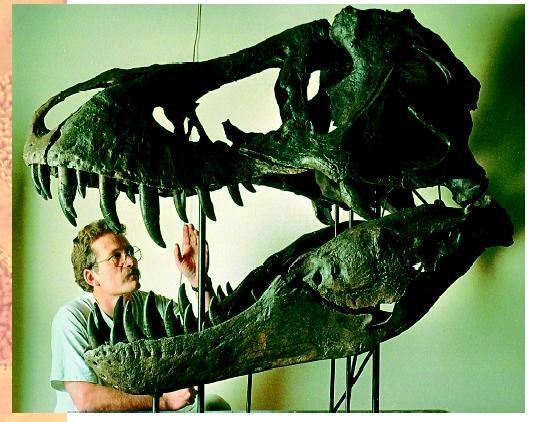 Peter Larson, president of the Black Hills Institute of Geological Research, studies the skeleton of a Tyrannosaurus rex . Fossils of single-celled organisms are known from rocks approximately 3.5 billion years old, and chemical traces of life (carbon isotopes of presumed biological origin) may extend even further back in time. It is an undeniable fact that the fossil record is an incomplete archive of the history of life, and this is especially true for organisms with poor preservation potential, such as soft-bodied worms and jellyfish. However, the quality of the fossil record is surprisingly good for those animals with durable skeletons, such as brachiopods, trilobites, mollusks, and vertebrates. Many subfields fall under the broad heading of paleontology. The majority of modern paleontologists focus their efforts on describing fossils and deciphering evolutionary history, or phylogeny. These "paleobiologists" tend to specialize on particular groups of fossil organisms, such as single-celled prokaryotes or eukaryotes , plants, invertebrates, or vertebrates. Through their efforts scientists gain a deeper understanding of life's evolution and diversification through time. Scientists also gain a better appreciation of the evolutionary process, because the fossil record provides the long-term record of evolution in action. Indeed, proposed modes of evolutionary change, such as phyletic gradualism and punctuated equilibrium , are based on patterns derived directly from the fossil record. Another active branch of paleontological research is paleoecology, which is the study of the relationships and interactions between fossil organisms and their paleoenvironments. Paleontologists engaged in paleoecological research might focus their efforts on a single taxon . For example, a paleontologist may choose to study the predatory activities of a particular fossil snail by tracking distinctive traces of its predation (borings) in associated fossil bivalve shells. Another paleontologist may examine the fossilized leaves and woody tissues of ancient trees in order to identify diagnostic traces of a fossil insect that made its living within the tissues of the extinct plant. Still another may study the contents of fossilized feces (called coprolites) in order to decipher the dietary preferences and digestive capabilities of an extinct species of dinosaur. On a larger scale, paleontologists may choose to track ecological changes in entire communities through time. A prime example of this type of paleoecological research would be the analysis of ancient plant communities in response to long-term climate change. Yet another contemporary field within the realm of paleontological research is taphonomy, which is the study of how organic remains are incorporated into the rock record. Taphonomic analyses focus on the post-mortem history of biological remains, such as decay, disarticulation (separation of body parts), transport (perhaps out of life habitat), and burial. Taphonomic studies can reveal important trends and biases in the fossil record, which must be recognized in order to produce accurate paleoecological and evolutionary reconstructions. At the most basic level, taphonomy points out that the scarcity of soft-bodied creatures in the fossil record is not due to scarcity of the original organisms, but to the poor preservation of soft body parts. Finally, many paleontologists today are engaged in research directly related to the phenomenon of mass extinction, which unfortunately is also a contemporary environmental issue. By tracking the record of extinction through time, paleontologists can provide unique insights into the potential agents that cause the decimation of entire ecosystems on a global scale, such as extraterrestrial impacts. They can also gain an appreciation for the timing and nature of biotic recovery after major extinction events. Briggs, D. E. G., and P. R. Crowther, eds. Paleobiology: A Synthesis. Oxford, England: Blackwell Scientific Publications, 1990. English paleontologist who supported her family by finding and selling fossils. For example, she dug up the first complete skeletons of swimming dinosaurs, the ichthyosaur and plesiosaur. Although a woman of low birth, Anning was recognized as the most knowledgeable paleontologist in Great Britain in the early nineteenth century. In her old age, the British Association for the Advancement of Science helped support her.